It was June 24. It was 2005. It was time to geek out at Paramount's Kings Island. That we did. Starting off the day, Evan accidentally slept until around 10:30. He woke up and called me. Yup. So, we left. We got right to the front gate, picked up my ticket, and walked in. Evan got yelled at by the security guard for having his hands in his pockets while going through the metal detector. He walked backwards and then forwards again. Somehow, he passed. Amazing. I got through without trouble. We got in, turned left, and went for the Son of the Beast. Broken. Figures. So, we went on Top Gun. Evan spotted a vending machine or two on the way. I said "No, Evan. Wait for huge expensive drink." We got out, and Evan asked for food. I said no. We went on to ride more stuff. 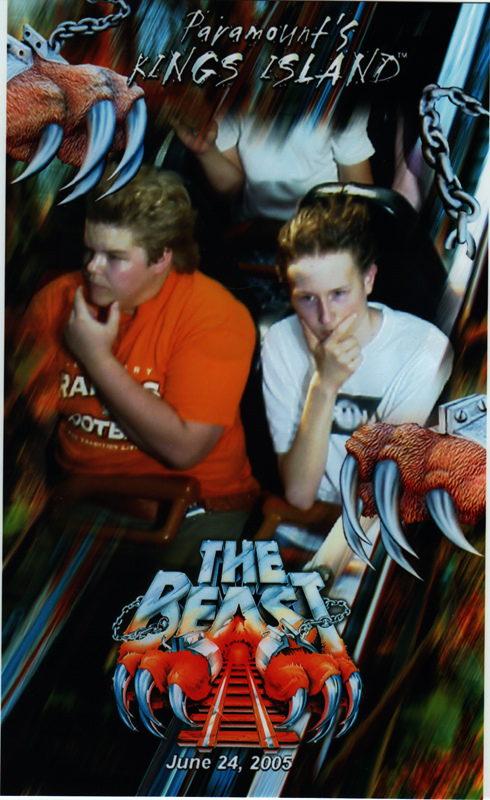 We got on the Beast at some point, and on the way up we planned a pose for the camera, since Evan knew exactly where it was. We decided, that as we are ultra cool geeks, we should (naturally) be thinking very hard on the way down the first hill. We took a thinking pose at the top of the hill, and held it until we passed the camera. It turned out GREAT! At like 3:00, we got on the White Water Canyon ride to cool off, not expecting to get drenched. We did. And I was wearing jeans. Woohoo. So we're wet for the rest of the day. We later had popcorn chicken, and of course later got a ride home. Evan's dad asked me what I thought about Apple switching to IBM. I was too tired to correct him, so I said "I don't know" as I usually do to most questions. If you live under a rock, let me fill you in. Apple recently announced that they are going to start using Intel processors in their Macs, rather than what they use now, IBM processors. I guess Evan got the companies mixed up too. It's not really a big deal. So, that was our day. We plan to go again with a camera, and get you guys some great photos. That will be awesome. Evan often asked during the day to eat something. We never really did sit down to have a "meal" per-say. Interesting how it turned out, eh? We rode the new ride, The Italian Job, twice. It broke down 4 times in the day, that we know of. It seemed to be a problem with the final brakes right before it goes into the station. We didn't die. That's good. Evan raved about this ride. Though, Nathan still agreed that Face/Off is one of the best rides there. It may be very short, but it is very intense. Evan also has several "when-I-ride-this" rituals. One of them is on the Beast, where he slaps a certain board as the train comes to the end of the track. Nathan thinks this will eventually cut his hand off, and he won't be able to get it due to legal liabilities. Evan thinks this is preposterous!